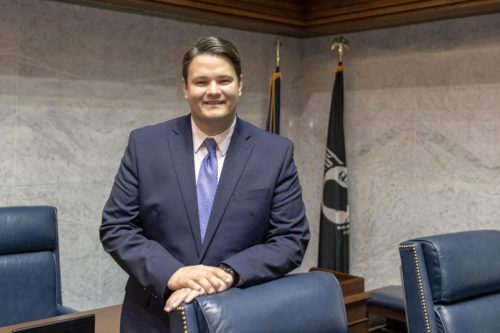 The first out gay legislator in Indiana took his oath of office today, two weeks after he soundly defeated one of the most anti-LGBTQ senators in the chamber. Sen. J.D. Ford (D-Indianapolis) took the oath from Chief Justice Loretta Rush this afternoon. The Senate gallery was filed with about 200 of Ford’s well-wishers, campaign volunteers and friends. Indiana is one of only five states without a comprehensive hate crime law. Holcomb signaled a shift in Republican priorities, when he called for passage 45 days ago. Ford hopes that brings other Republicans into the fold. Ford defeated two term Sen. Mike Delph, who was a steadfast opponent of marriage equality and pro-LGBTQ initiatives. Delph was a darling of the “religious liberty” crowd during Indiana’s famous fight over the “Religious Freedom Restoration Act,” championed by then-Gov. Mike Pence. Ford ran against Delph in 2014, and lost by a small margin. He immersed himself in district issues and ran an aggressive grassroots campaign that also raised almost $400,000, a significant amount for a legislative challenger. Walking onto the Senate floor, he was greeted with loud applause. “That’s a moment I’ll never forget,” Ford said. Ford joins a small Democratic caucus in the Senate, which is 40-10 Republican. He hopes to cut across partisan divides on issues he outlined in his campaign” education chief among them.